Gouda is a semi-hard cheese from the Netherlands that is easy to shred and has loads of flavor, perfect for Brussels sprouts. Toss in some sauteed pecans and habanero peppers and you're really cooking. This is an outstanding side dish. Stem and quarter the Brussels sprouts. Boil for 2 minutes. Drain. 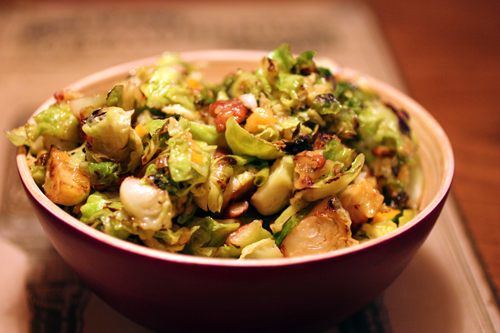 Heat a saute pan to medium heat and add the Brussels sprouts with oil. Saute them about 8 minutes. Add nuts and cook 2 more minutes. Remove from heat. Toss with gouda and fresh habanero while still warm.